Just a few years after their market introduction, digital devices are abundantly present in people’s everyday lives. We now live in a multiple-screen environment and may use up to ten different devices with screens in a single day (laptop, desktop, tablet, console, digital TV, GPS, e-book reader, digital code device, smartphone or smartwatch). Users today want to be connected at all times. However, these new media are affecting their vision and posture. To measure this impact, the Ipsos institute conducted a broad survey on four continents with four thousand people. The results show the growing challenges posed by this new digital reality to public health. Today, digital devices have become an accepted part of everyday life, irrespective of age, social class or geographical area. After years of undisputed reign, the supremacy of television and computers has now been challenged by a massive influx of small screens – smartphones, tablets, e-book readers and game consoles – that have truly revolutionized digital practices. In less than ten years – the launch of the iPhone barely dates back to late 2007, and the tablet to 2010 –, these new media devices have emerged as essential everyday tools, generating new habits and new needs. To measure the impact of the use of these new devices on users’ vision and posture, Ipsos conducted a broad survey on an international scale in four countries (Brazil, China, France and the United States), with four thousand people aged 18 to 65. 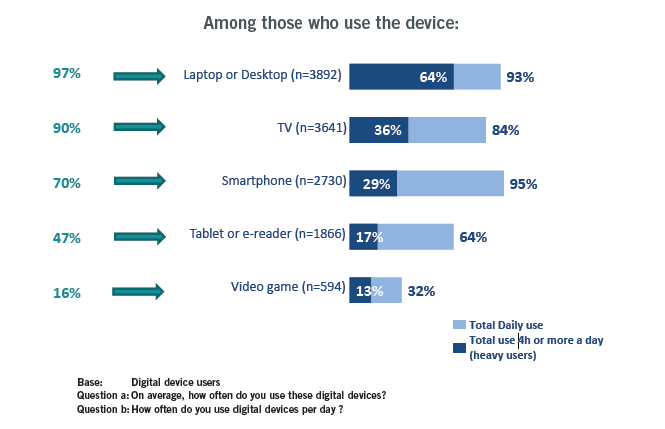 The use of digital screens is now a daily reality for a very large majority of the population. Young and old alike use them several hours a day, and 29% of smartphone owners have their eyes riveted on their phone screens for more than four hours a day. Opportunities for use are varied and include reading, writing, watching videos, taking photos or videos and much more. Fig. 1. The increasingly intensive daily use of digital devices, particularly small screens – the smartphone is the most frequently used device on a daily basis –, involves a certain amount of discomfort, and users are well aware of this: 89% have felt discomfort or pain in their eyes, which they associate, at least in part, with their use of screens. But most of the time, their symptoms seem to be temporary and fairly harmless: they complain of eyestrain (74%), itchy eyes (50%), dry eyes (46%), rather than report that their eyes sting (34%) or hurt (35%). Their eye symptoms, especially eyestrain (which 51% describe as moderately or highly bothersome) are considered just as uncomfortable as the bodily pain affecting the neck and shoulders (54%) or back (51%) Fig. 3. 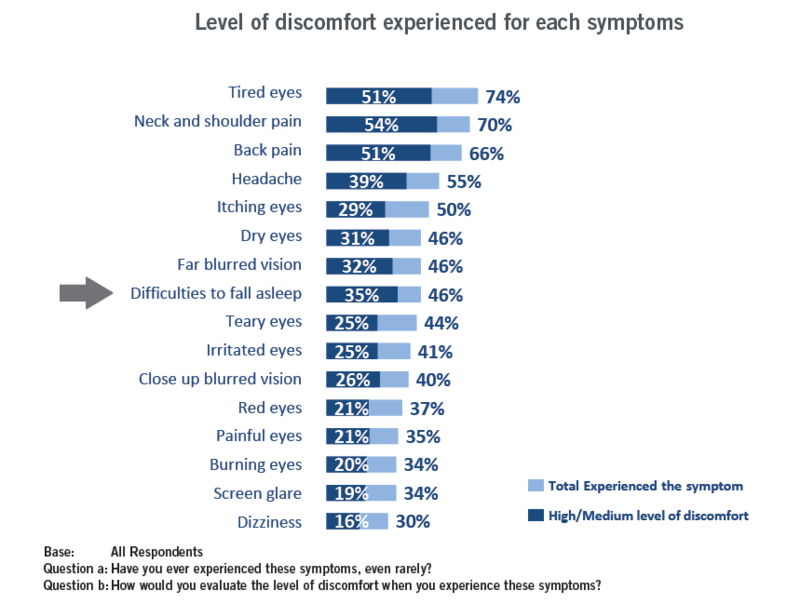 In addition to these visual and physical symptoms, 46% of respondents report they have difficulty sleeping, including 35% for whom this is a real problem. - There already seems to be a very strong link between intensity of screen use and the symptoms felt. In other terms, the longer and more frequently one uses digital devices, the more one is affected by ocular or physical symptoms. Small screens, especially those found on smartphones, tablets, or game consoles, seem to cause more problems for the eyes, due in particular to difficulty reading small type: people using these devices heavily (i.e. more than four hours a day) seem to feel that they have dry eyes more often than others (62% had already experienced this symptom, versus 46% for all users) or experience sore eyes more often (46% versus 35%). And as the use of digital devices continues to expand, it is likely that more and more people will face these symptoms in coming years. - Moreover, more than half of those reporting one of these symptoms feel that their symptom(s) are worsening over time, and becoming increasingly troublesome. - Users of digital devices also encounter the problem of blurred vision, when viewing them close-up (40%) or from afar (46%), which may be perceived as getting worse over time (31% for distance vision, and 29% for near vision). - Despite these specific signs, few envisage spending less time viewing screens: over 40% of those surveyed state that they have simply not considered reducing the length of time or frequency they use their digital devices to relieve their symptoms, illustrating by this attitude their increasingly strong dependence on these everyday objects. Most of the time, users opt for quick, simple solutions, such as taking a break, changing position or looking away from the screen from time to time. It is also noteworthy that 60% have already tried to change the brightness of their screen, and that 40% wear dedicated eyewear during screen use. Fig. 4. Since they use these devices for longer periods and more intensively than those over fifty, young people are the primary victims of damage related to digital device use, even before they become presbyopes, they now seem to suffer from a greater number of ocular and physical symptoms than their elders. Tired or sore eyes, headaches and blurred distance vision are felt far more frequently by those under forty year of age. These symptoms are also accompanied by a greater awareness by those under forty of the link that may exist between the use of screens and visual discomfort. Everyone is concerned by eye problems, including wearers of corrective lenses, and particularly contact lens wearers. A significant proportion of non-wearers are also affected: 61% of them have the impression that they must make more of an effort to see well when using digital devices (versus 66% of corrective lens wearers). Finally, countries like Brazil and China, which are experiencing an unprecedented boom in the use of these new digital media, are also particularly exposed to this situation, due to their usage practices: in China, 45% of smartphone users say they use their phone over four hours a day (versus 29% for all countries), and for activities that are often more time-consuming than average (i.e. watching a film or a video, reading for long periods, etc.). 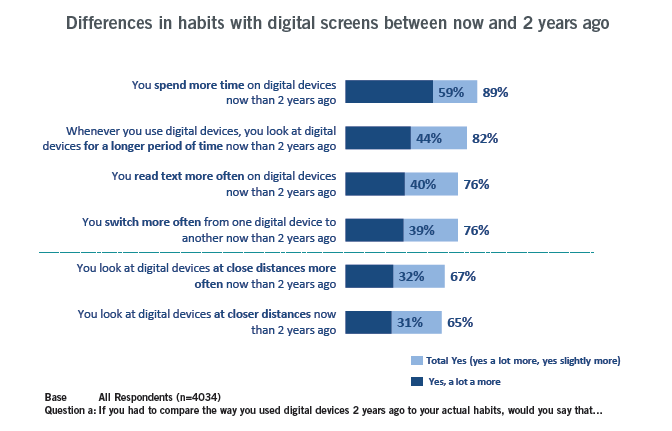 What are the potential risks of digital screen use and what solution(s) are available to prevent them? Even though they are aware of being “addicted” to screen use, people still seem to be insensitive to the risks inherent in prolonged use of digital devices. For example, the danger to the brain of increased exposure to electromagnetic waves, supported by numerous scientific studies, is a topic that comes up regularly in the news without provoking much of a reaction from the public (in France, ANSES published reports in 2009 and 2013, that were widely reported in the press; and a law governing public exposure to electromagnetic waves was adopted on 29 January 2015). Similarly, users of digital devices do not yet clearly perceive (or do not wish to perceive) the possible link between increased exposure to screens and a potential decline in their eye health. Regardless of the digital device used, those surveyed see the screen more as a source of eyestrain than as a potential danger for their eyes. For example, smartphones are considered by 27% as a device that could damage the eyes, while 39% consider instead that it is simply responsible for visual fatigue. Fig. 5. Currently, sunlight and exposure to UV radiation are still considered the main risk for the eyes. 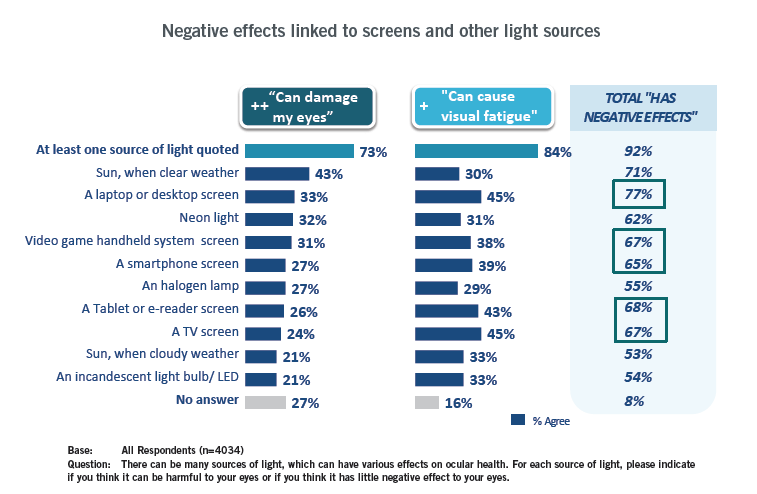 As for blue light and its potential dangers, this remains an elusive concept for most people: only 47% consider spontaneously that they are familiar with the principle of blue light but, in fact, when it is explained to them, over half realize that they are not familiar with this phenomenon. Awareness of the potential dangers of the intensive use of screens and the cumulative effect over time is more important than ever, particularly among young people, who are by far the most intensive users of digital displays. Healthcare professionals have an important support role to play in their education. Faced with these new uses for digital devices, a dedicated eyewear range, designed to relieve the eyes and protect them would appear to be quite relevant: 77% of those surveyed state that they would consider purchasing this type of eyewear, particularly the most intensive users of small digital displays. And those who do not wear corrective lenses should not be ignored, since 65% of them also state that they are interested. Despite this positive reception in principle, the challenge in marketing this new type of eyewear will be to convince people of its effectiveness and, more importantly, to create a desire for it, particularly when we understand that the populations most concerned are those most averse to wearing glasses on a daily basis (i.e. people under forty and contact lens wearers, in particular). For this reason, an appropriate educational effort must be made to really convince the different target groups of the tangible benefits of this type of eyewear. 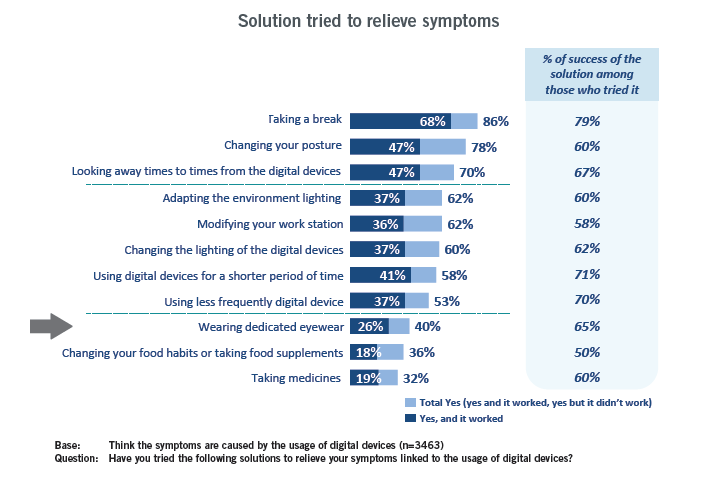 In view of the visual and physical discomfort reported by those surveyed, an improvement in visual comfort and a decrease in fatigue and headaches are the benefits expected by digital device users. With rapidly changing digital use practices, everyone is or will be concerned by the potential dangers represented by these screens. But increased awareness of the inherent risks is slow to develop; certainly, physical and ocular discomfort are increasingly felt by digital device users in their daily lives, but the long-term effects remain poorly understood. Healthcare professionals therefore have an important role to play in heightening people’s awareness and helping them protect themselves, in the face of this growing public health challenge. • Half of respondents are bothered by strong screen brightness.